While 2003 will go down in WBC history as the Year of the Voucher, clearly the 2003 Panzerblitz tournament could be called the Year of the Default, as six defaults, and one overrule, nullified one opponent after another. The tournament sustained its required number of 16 entrants, benefiting from an early bird mulligan round Tuesday evening Situation 1 competition, where two players, both rookies, met new friends and tested their skills, but their schedules precluded them from attending the official tournament on Wednesday. 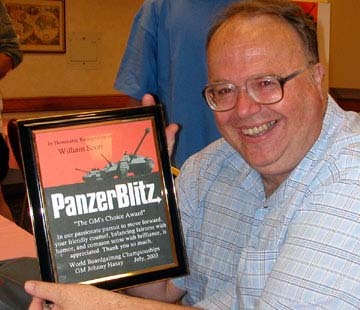 It began with a number of awards given to those whose continual service to Panzerbitz, help make it as enjoyable as it is: Alan Arvold, Devotion to Duty; Kurt Kurtz, Pleasure to Play; Steve Andriakos, Risen from the Ranks; Mark McBride, '02 Rookie of the Year; and Bill Scott, GM's Choice. The Situation 1 Early Birder had eight players battling to either destroy or defend the German CP forces. With rookie John Clark, Matt Sptiznagel, '02 champion Marty Musella, and Johnny Hasay, knocking out the others, Hasay bowed out after defeating a very much improved Spitznagel, leaving Clark and Musella to play off against each other for the winnings. Marty again reigned supreme to take home the prize, Stalin's favorite vodka mug! As 14 single elimination players opened on Wednesday, Spitznagel fought his way through two opponents to third place, losing to veteran Chuck Leonard in Situation 1A, the tourney's favorite, on points of 18 to 10. Bill Scott met Leonard in the final round in a more interesting way. Having been beaten tactically by Johnny Hasay in Situation 4, he cried foul the next day, as it was determined a critical battle had been resolved improperly. Both players amicably agreed to a die re-roll, 2 actually, and upon a reversal of the battle's outcome, the game was a marginal draw. Bill, being the underdog, advanced to the next round, where he skated through two defaults. Then, as Leonard waited patiently for his foe, a refreshed Scott, having returned from a late hour dinner, sat down to play Situation 1A. Chuck's German forces set up a hole which Bill's Ruskies saw the opening on Chuck's right flank, sending three rifle units onto the road on turn 2, and eventually scoring three points. As Chuck covered his exposed flank, Bill sent his T34s and recons into Chuck's center, knocking out a 20mm gun, and capturing a road hex. Chuck battled back as his halftrack raided a Russian mortar. But near the end Bill's cavalry pinned down Chuck's left flank tanks, and positioned his T34s on the road creating a critical battle. With a 50/50 chance of success, Bill won, thus scoring 11-10 overall. Any draws would have resulted in underdog Chuck taking the wood, so this contest was as close as they come. Scott seized victory, his third wood in the last four years. All in all, seven rookies joined the old guard list of players, including veteran GM Chris Harris, noting that the old warhorse Panzerblitz is still attracting new faces, as other non-players stopped by to say howdy! 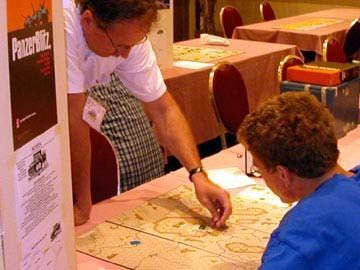 With wedding anniversary congratulations to Dave Giordano, rumored to have retired from war gaming, all bid farewell to take on Scott in 2004!